As an alternative to the high realism that is often extremely time consuming, I began trying my hand at monotypes and monoprints. My most realistic monoprints and monotypes appear in my landscape sections of this website. Here I concentrate more on semi-realistic, subject-suggestive, semi-abstracts or outright abstracts, mostly made with a brayer, though I give all of my prints a name related to what I see in the images. It's a bit like a rorschach test, perhaps. 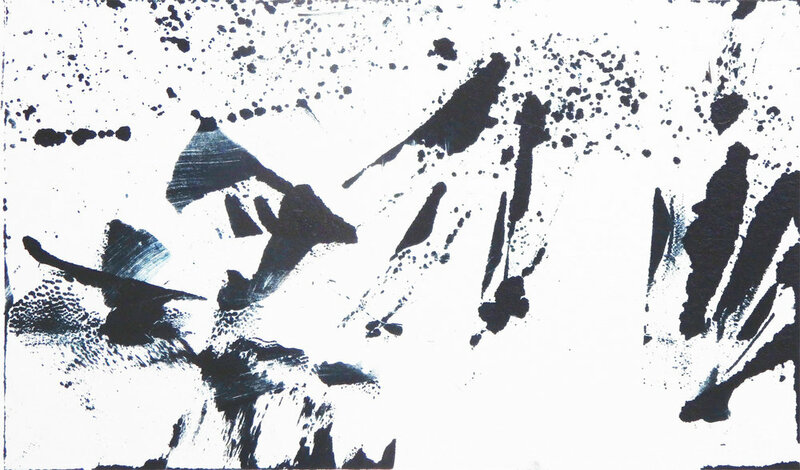 A few of these monotypes use a subtle second color in addition to a bluish or brownish black ink. I used pastels for the monoprints. "Abandoned" Monotype 3 1/2"x 5 1/2"
"Abandoned" reminds me of a couple of battered old boats that have been left to rot on a beach. "After the Storm" Monotype 5 5/8" x 8 5/8"
"After the Storm" looks like it could be on the edge of a wooded area, and it also looks a bit battered. 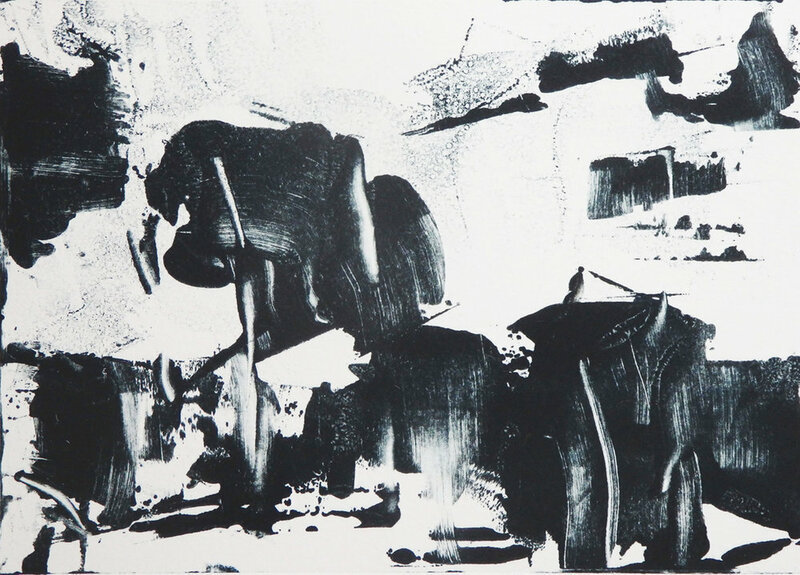 "Cathedral" Monotype 3 7/8" x 5 7/8"
"Cathedral" got its name from the cross-shaped form on the right side of the print. The slashy forms and the fuzzy-edged variation in values reminded me of the light that flows through stained glass windows into a darkened interior, too. "Duck Hunting" Monotype 3 5/8"x 5 1/2"
I see a group of hunters hiding in foreground reeds and a duck in the upper center in "Duck Hunting". The diagonal lines moving across the picture suggest the paths of bullets fired at the duck. "In the Yucatán" Monotype 3" x 4 7/8"
I've spent nearly two months "In the Yucatán", Mexico. Some of the population in the rural areas live in very simple thatched homes. While the image that looks like a windowed, thatched hut on the left of this print isn't necessarily what most rural houses look like, something about all the shapes in this image brought the Yucatán to mind. "Evacuation" Monotype 3 15/16" x 6"
I named this piece "Evacuation" because the image on the left reminded me of a Vietnam War U.S. helicopter and the evacuation of Saigon. Other marks suggest the wind generated by the blades or the dense foliage. 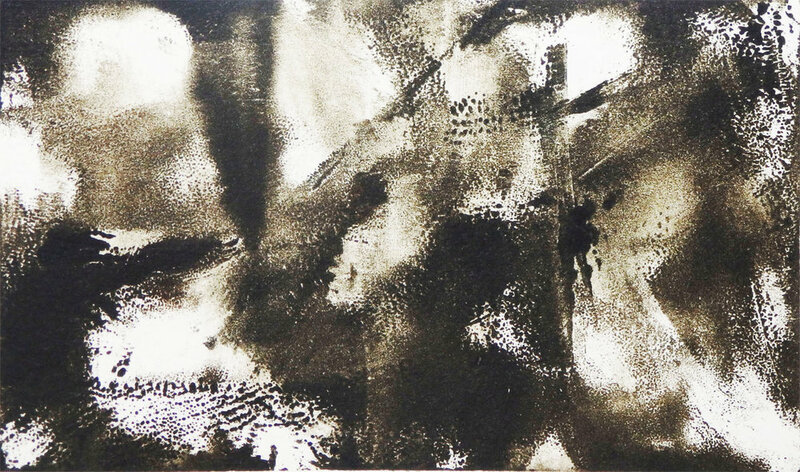 "Manhattan Tragedy" Monotype 2 7/8" x 4 7/8"
"Manhattan Tragedy" is my memorial to the World Trade Center. I loved looking at those towers, amazing symbols of New York for many decades, and I miss them. The skyline will never feel right for me again. "Lily Pond" Monotype 3 7/8" x 6"
"Lily Pond" is like most of my abstracted monotypes, an experiment with a rubber brayer. The shape reminds me of the structure of a lily pad. "At the Pond" Monotype 3 7/8" x 5 7/8"
The shape in the center of "At the Pond" reminded me of a dragonfly, and the other shapes reminded me of foliage or reflections on water. "Batten the Hatches" Monotype 3 7/8" x 5 7/8"
"Batten the Hatches" reminded me of a rigged ship being confronted by a storm at sea. I had recently read In the Heart of the Sea, about the sinking of the whale ship Essex. "Could Be Better" Monotype 3 7/8" x 6"
"Could Be Better" may be somewhat evocative of a scene in nature, but I based the title on the general sense of agitation and somewhat ominous complexity. "Garbage Pickup" Monotype 4 5/8"x 6 5/8"
It took me a while to come up with a reference title for this monotype, "Garbage Pickup". There are a number of nondescript shapes that could be bits of debris, and perhaps the form that seems to be flying (over a fence?) is being tossed by someone. A large shape on the lower right could possibly be a garbage can. 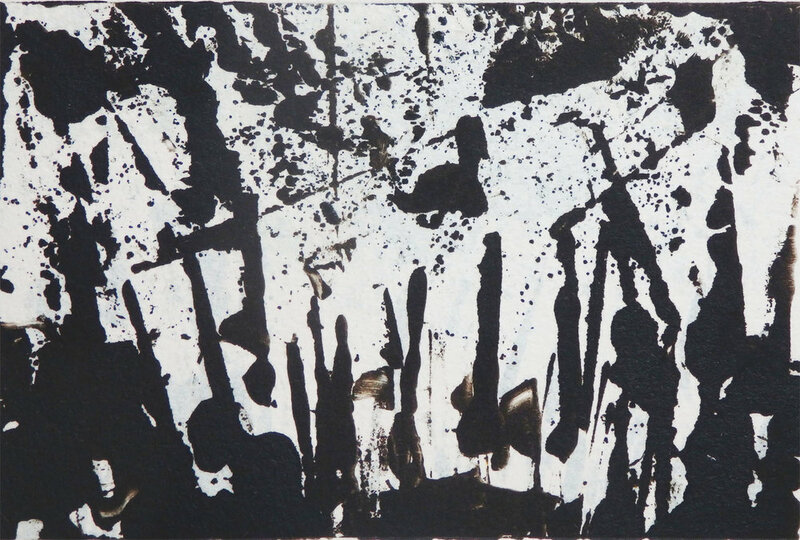 "Rugged" Monoprint 4" x 5 7/8"
The black and white shapes in a ghost print I call "Rugged" reminded me of a scene in a canyon in Yellowstone. I preserved the shape of a conifer on a steep side of the canyon on the right. "Labor Day at the Beach" Monotype 5 5/8"x 6 1/16"
There's quite a bit of implied commotion in "Labor Day at the Beach" of random shapes, but there is a shape almost dead center that seems to be shaped something like a folding chair that is used for outdoor sports events or relaxation. "Crucifixion" Monotype 2 13/16" x 4 13/16"
"Crucifixion" resembles"Cathedral" a bit, but there seems to be a figure coming down from the cross shape on the right. There are also textures similar to those on fingerprints and an image on the left that looks a bit like part of a hand. 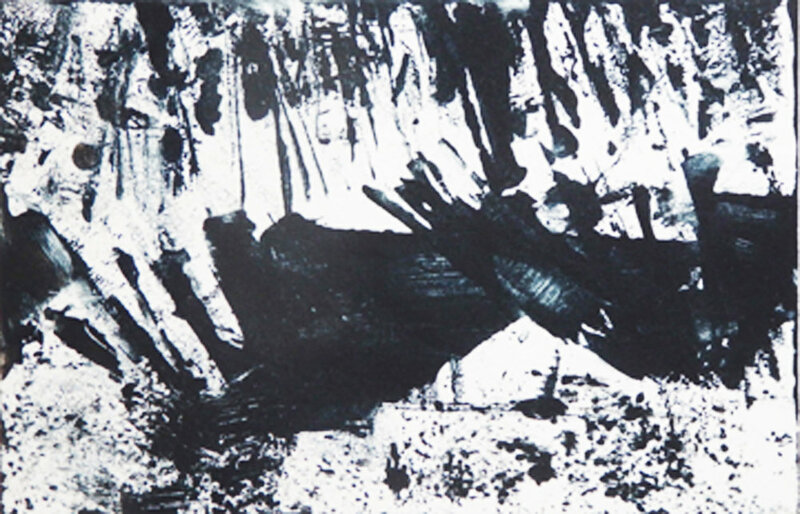 "Tyger, Tyger" Monotype 3 15/16 x 6"
The shapes in "Tyger, Tyger" reminded me of a tiger in the forests and fields of India. I took the title from the poem by William Blake, "The Tyger". "Wildfire" Monotype 3 15/16" x 6"
"Wildfire" appears to me to show people in the foreground and flames consuming trees in the background. My father's family hailed from the Arizona high country ponderosa pine forests, where fires are a serious threat every summer. "The Education of a President" Monotype 4" x 6"
The central, highly smeared image here of a face with wildly blowing hair and with swirling chaos surrounding it reminded me of our current state of political affairs here in the U.S.
"Iris" Monotype 2 3/4" x 4 3/4"
All rights to text and images is reserved by the artist.